Eric Lefort is a French daytrader and author. He focuses on important support and resistance levels. Available (for free) from Eric Lefort in the NanoTrader trading platform. This signal opens a position when the market price closes above a special down-ward sloping (or horizontal) trend line designed by Eric Lefort. The signal only takes long positions. Eric Lefort's special trend line is first drawn in black. It is drawn between two market highs, following precise criteria. The user can change the criteria if wanted. When the trend line is validated for trading, the extension turns green. The validation for trading is only valid for a fixed number of periods. In this example two of Eric Lefort's trend lines are visible. In both cases a buy signal is given because the market price closes above the green extension line. It is interesting to note that this strategy allows traders to enter in both a bullish continuation (trading signal #1) and a bullish market reversal (trading signal #2). situation. The bullish break-out signal is available for free in the NanoTrader trading platform. Eric Lefort's Mogalef bands are his expected future trading range of a financial instrument. Imagine them projected forward as the most likely levels between which the market price will evolve. A trader using the Mogalef bands must open both a 5-minute and a 30-minute chart. The signals are generated on the 5-minute chart. The 30-minute chart acts as a trend filter. The trend filter colours the complete chart background green, when the trend is bullish, and red, when the trend is bearish. The trend filter automatically blocks short sell signals in a bullish market and buy signals in a bearish market. This example shows a buy signal. The market price dropped below the Mogalef band, indicating that the market price is below the price range expected by trader Eric Lefort. The signals filter indicates a green background in the chart. The trader can buy. The E.L. Mogalef bands trading strategy is available for free in the NanoTrader trading platform. 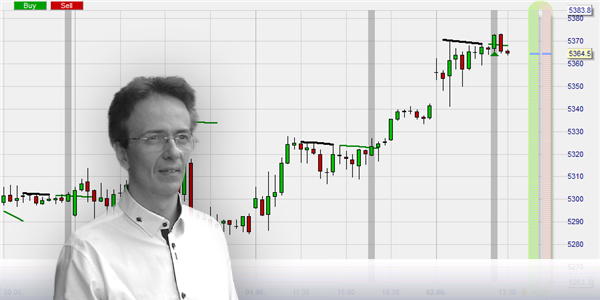 Eric Lefort is known for his proprietary patterns which he uses to identify break-outs. Particularly his unique bullish and bearish trend line break-out system (see above) enjoys a good following. Recently Eric Lefort added triangle and wedge break-out patterns. The six patterns included in the package are all his bullish and bearish trend line, triangle and wedge patterns. All the tools in the package can be used on any financial instrument (forex, indices, commodities, etc.). The package is available for the NanoTrader trading platform via the WH SelfInvest trading store. Experience a real trading platform... download a free NanoTrader demo.